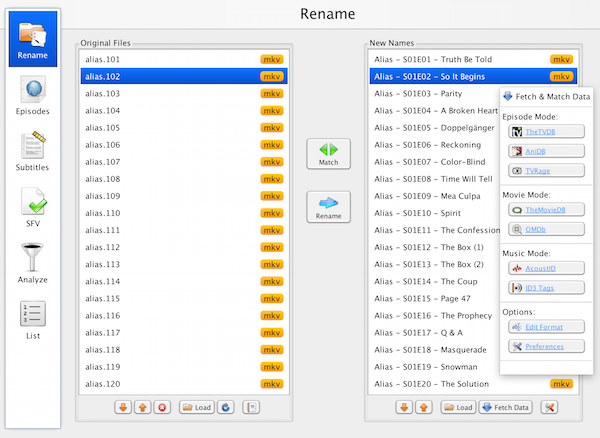 FileBot makes organizing your movies and TV shows a breeze! We'll automatically match your files with information from various online databases. 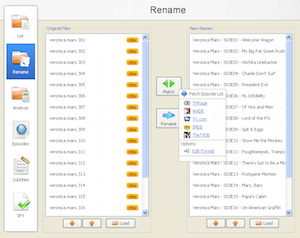 How you want your media files to be named and organized is completely up to you. Our groovy format engine supports pretty much anything! Fetching subtitles is just as easy, just drop it in! Besides automatic lookup you'll also be able to manually search and download subtitles, preview subtitles and fix encoding problems (e.g. force UTF-8). Use FileBot on the command-line! There is a simple CLI for core tasks like renaming media files and fetching subtitles as well as checking or creating SFV files. On top of that you can use our scripting engine to define more complex automated processing. There's already shared scripts for various tasks that you can just run right away or further customize to your needs. Setting up a fully automated media center – extract archives, organize tv shows and movies, download subtitles, fetch artwork and metadata, update Kodi – with FileBot it's that easy! Identify and rename music using AcoustID audio-fingerprints and MusicBrainz info. Extract files from zip, multi-volume rar and 7zip archives as well as ISO images. Microsoft Store and Mac App Store purchases neither include nor require a universal license. The project is continuously seeking for improvements, so any kind of feedback is more than welcome and if there's any questions or problems just start posting in the forums or check the FAQ. We're social as well. Follow us on twitter, become a fan on facebook or join our Discord channel.